It’s worth making this salad for the tomatillo dressing alone. 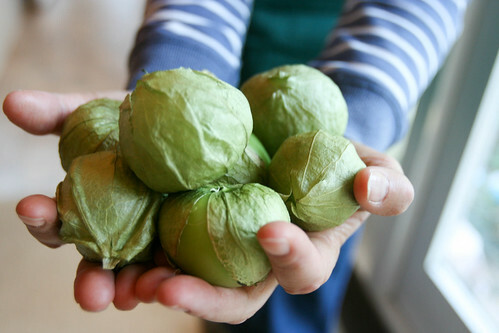 Tomatillos are a rare treat here in the UK – I totally took them for granted when I lived in Austin and Chicago. Now they’re far more tricky to come by (and my attempts to grow them have been literally fruitless). When the season’s right – late summer, early autumn – they’re available on order from Riverford (my vegbox scheme) and Cool Chile Co (a UK-based supplier of Mexican goodies). So this season I’ve been shelling out some cash on tomatillos so I could experiment a bit with this funky green tomato (which is actually a relative of the cape gooseberry). This tomatillo dressing is my favourite creation thus far. Most of what I know about tomatillos comes from Mexican cheese enchiladas verde, one of my favourite Mexican dishes which consists of corn tortillas wrapped in cheese, smothered with tangy green tomatillo “verde” sauce, topped with more cheese, then baked to perfection. 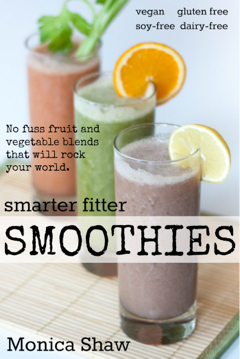 Not exactly heart-healthy, but incredibly delicious. My other favourite tomatillo memory is the spicy tomatillo salsa from Trudy’s Restaurant in Austin, Texas – I have ruined many a dinners overeating corn chips and salsa at this place (not that I’m complaining; their salsa is some of the best I’ve ever had). With this salad, I wanted to do something to celebrate the tomatillo’s natural aptitude for tart tangy salsas, but without the artery-clogging qualities of excessive cheese and fried corn chip accoutrements. So I turned the tomatillos into this zesty salad dressing that really knocked my socks off and even surpassed some of the verde sauces I’ve had in Texas. The key steps are broiling the tomatillos until they are well-charred, and adding just a bit of olive oil to the blended salsa to give it a nice creaminess and turns this salsa into an excellent salad dressing. Here I used it with the green beans and sweet corn that came in my vegbox, but you could just as well use it to dress a green salad or even grains and beans (black beans and rice come to mind). The tomatillo dressing also goes nicely with fish – I served this salad with sea bream, steamed with lime and cilantro, and I ended up using some of the dressing on the fish after it came out of the oven – superb. The only downside to all of this is that tomatillos are so rarely available, but that rarity adds to my appreciation of them. And now I know that when I am lucky enough to have tomatillos, I have a reliable and healthy recipe to turn to that does them justice. 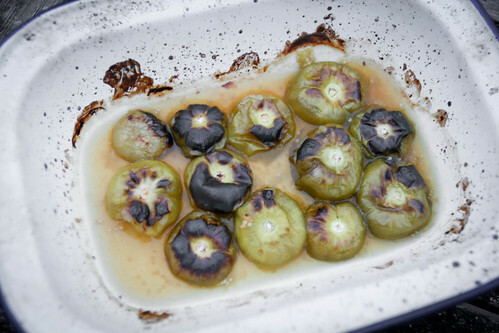 Pre-heat the grill and put your tomatillos in a roasting tray. Put the tray under the grill and cook until the tomatillos are charred, then flip them over and let them char on the other side. 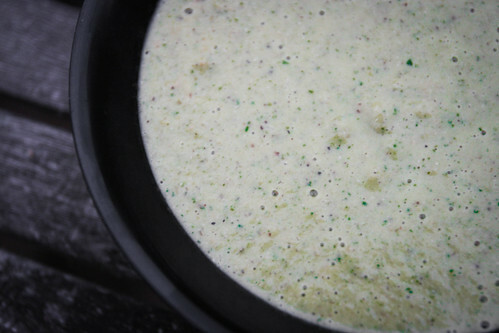 Combine the tomatillos and any juices in the pan with all of the other dressing ingredients and blend until smooth. Taste and add salt as needed. Steam the corn and green beans for 5 minutes then rinse them under cold water. Halve the green beans and slice the corn kernels off of the cob. 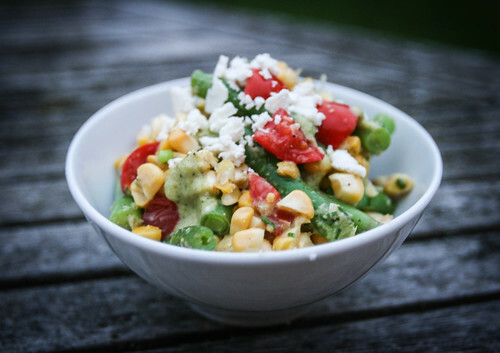 Combine the beans and corn in a bowl with the tomato, chives and a couple spoonfuls of the dressing. Season with salt and pepper. 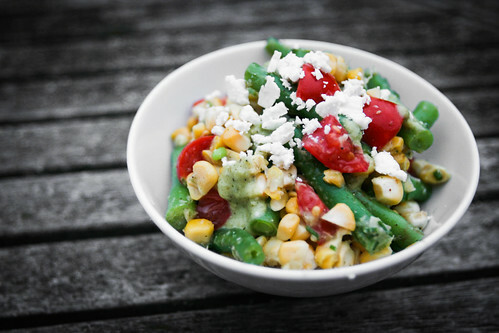 Serve in a bowl, drizzled with a little more dressing and garnished with crumbled feta cheese. Hi Monica, This looks yummy, and I can’t wait to try it. Have you ever considered doing a week long cooking school? I have thought several times that I would love to spend time around you learning how you eat everyday, more about what your philosophy is about food – really believe that I could learn a lot from you. If you ever do decide to do that, sign me up,and I will be there. I just think that so many people could benefit from what you have to say. Oh, and if you want to come to Austin and do it, I would love to help you put it together. Have a great day.